The BERNINA 820QE offers high-performance features allowing you to create more, create bigger and create for longer than ever before. So it’s no wonder that the 820QE receives the highest praise from quilters, fashion designers, fiber artists and crafters. Room for great new sewing ideas! 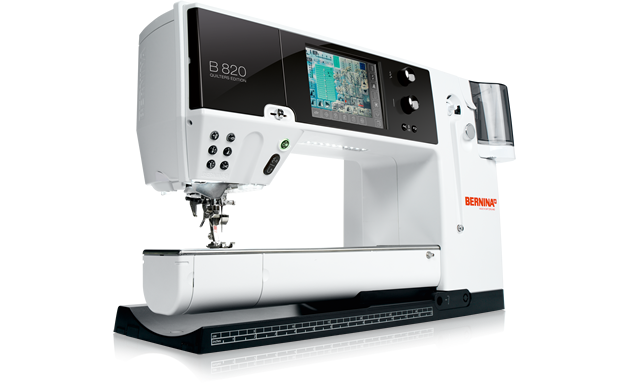 The 820 offers substantially more space than a standard sewing machine, or than the other BERNINA models. The approx. 400-mm (15-inch) extended arm and over 300 mm (12 inches) to the right of the needle provide ample space for your projects, allowing for easy spreading out and manoeuvring the fabrics. Top speeds with excellent sewing results and perfect stitch formation! The BERNINA 820 delivers up to 1,100 stitches per minute in sewing mode, consistently guaranteeing fast speeds, even with wider stitches. Thanks to a substantially larger bobbin, the BERNINA 820 offers 40% more thread capacity, thereby reducing your set-up time and leaving you more time for the creative side of things. What’s more, the jumbo bobbin is easy to use: When the hinged lid is opened, the hook swings out and the bobbin pops out at the touch of a finger. A BERNINA exclusive: Each stitch pattern can be customised and saved! The BERNINA Stitch Regulator (BSR) ensures total control in your creative endeavours. The revolutionary BSR System makes free-motion sewing a cinch and a sure-fire success. Your stitches remain consistent, whether you sew fast or slow. Ideal ergonomics! The touchscreen is centrally located, so that both the needle area and the screen with the settings can be viewed completely in one quick glance. Large on-screen icons enable quick navigation, and the highly responsive screen makes for particularly user-friendly operation. The 5-inch TFT screen offers high-resolution images and bright colors from all viewing angles. Reliable feed of hard-to-handle materials! Working with knits, velvet, ribbon or multiple layers? The BERNINA 820’s built-in Dual Feed can be activated when needed, to feed the fabric from both above and below. The Dual Feed System offers optimum visibility and superb manoeuvrability. Simply flip up and tuck away when no longer required. Simple threading, automatically! The BERNINA 820 boasts a unique system for threading the machine and the needle, in a single operation.Because it’s done quickly and automatically, it leaves you more time to focus on the fun side of sewing. The exclusive multi-spool holder accommodates large, medium and small cones and keeps them at the ready. The thread supply system with ist built-in telescopic rod ensures ideal thread supply and smooth, even thread release when sewing. The bobbin winder is located on the front of the BERNINA 820 for ease of access, and even lets you select speed and amount of fill.